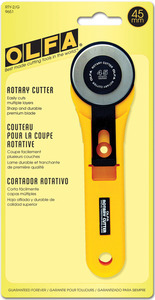 This 45mm Original Rotary Cutter changed the quilting and sewing industry! Introduced in 1979 and still the most popular size available. The razor sharp circular rotary blades made from high quality tool steel provide superior sharpness and edge retention. Used to cut materials into shapes, strips and pieces for sewing, quilting and craft projects. Features a straight, durable handle with a blade cover for safety. Designed for both right- and left-handed use. KM KR-A Stand Up Rotary Cutter Cutting Machine 5-6" Round Knife Blade Cuts 3"